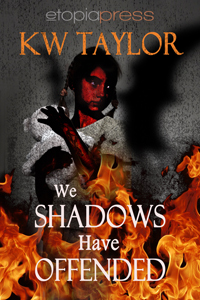 Today, I am delighted to be able to chat to Kathleen whose compelling Horror novella ‘We Shadows Have Offended’ has just been published by Etopia Press. After the death of a mutual friend, Sam, Bill, and Roger can no longer hide from the memories of what they all did that day... the day they killed the little girl. The little girl who wasn’t a little girl. Now it’s back, and it’s looking for them, leaving death and destruction in its wake, hell-bent on revenge. Can Sam summon the strength and courage to make a sacrifice that will save his friends and family? Catherine: Welcome Kathleen and congratulations on publication of ‘We Shadows Have Offended’. Without giving too much away, this is a highly compelling and inventive story of retribution. Is this an idea you worked on for a long time or did the inspiration suddenly come to you one day? Kathleen: Thanks, Catherine! I actually started this piece back in 2008 based on a writing prompt from one of my fiction-writing colleagues. He issued a challenge to several friends to write a flash piece simply based on the word “beginnings.” I fleshed this out to a working title of “The Beginning of Shame,” but then the story branched off into other directions and no longer really has any connection to that original idea. At first, this was supposed to just be a straightforward piece of period literary fiction about the first protagonist, Hammond, getting acquitted for murder but getting confronted by the victim’s father. That was actually all it was going to be, and it was just a couple of pages long. Then I got to wondering why he’d get acquitted, why he killed the young Naval officer in the first place, and it became a much longer, occult-tinged horror story. I think I had an idea of a nameless, faceless evil in mind as I wrote the rest of it, but I wanted to retain the original atmosphere of these strong, practical Midwesterners in a kind of vague era between the 1940s and ‘60s. I wanted the characters to seem relatable, but also retain a little of a bygone time period, which I felt made it seem more mysterious. Catherine: What made you start writing and when did you begin? Kathleen: I’ve always written stories, ever since I was little, but I got much more serious about it in my early twenties. When I realized I wanted to be a writer, I left my job to study literature and creative writing in graduate school, earning a master’s degree in 2003. In the mid-2000s, I was a part-time television and media critic for a local newspaper, and that got my confidence up to inspire me to begin submitting my short stories to markets. Since really committing myself to my craft, I’ve had fifteen pieces of fiction published, as well as over twenty reviews, essays, and pieces of media or literary criticism. My day job is teaching college English, so I always have a toehold in academic and scholarly writing as well, and I especially enjoy exploring the “thinky” side of popular and speculative fiction. Catherine: In addition to Horror, you also write Fantasy and Science Fiction. What draws you to each of your preferred genres? Kathleen: I sort of put everything under the umbrella of speculative fiction. If it’s not a straightforward, realistic story, I’m drawn to it, as both a writer and a reader. Though I have written more dramatic literary fiction, it’s almost never what I pick up to read for fun. I think the appeal for me is simply the heightened emotions involved. Characters make or break a piece of writing, and when you throw well-written characters into extraordinary circumstances, that brings all their personality traits out into a kind of wild, exaggerated place that forces them to examine their strengths and weaknesses. Speculative fiction can also do amazing things with metaphor, argument, theme, and general experimentation of form that I don’t think literary fiction can do as well. At the end of the day, I suppose I just like the idea that a work takes the reader completely out of his or her daily reality. Yes, there’s something to be said for a piece ringing really true to real life, but isn’t it that much more interesting to be taken on a journey through a land of fairies or vampires or out into the stars to other planets? Reading and writing is all about letting your mind explore things without the hindrance of reality. Catherine: You have the knack of scaring your readers, but what scares you the most? Kathleen: I think I covered a lot of my personal fears in ‘We Shadows,’ many of which are fairly universal: the body snatcher idea, the notion that the person you trust and know—or even the stranger you see walking down the street—isn’t quite human. That someone has been taken over and invaded by something with no regard for life or reason. That threat, the wildcard, the entity you can no longer trust…that’s terrifying. It’s sort of like the zombie or vampire trope but with a bit of a twist that I think makes it scarier. Being unable to trust the person next to you…that’s a horrible notion that throws everything into uncertainty, and I think a lot of horror works on that general idea of uncertainty. What was that noise? What are you doing with that knife? Why are you growing lots of fur and growling? We don’t understand what’s happening, and so we’re just insane with fear as we wait for the situation to resolve itself. In real life, I probably struggle with uncertainty. I’m not scared of a lot of general things that people tend to find frightening—for example, I’m a big defender of snakes as not being scary, and I don’t really believe in ghosts. But life uncertainty, that’s pretty upsetting. I’m a mess if I’m waiting for something to happen: a phone call, an answer to a big life-changing question, test results, that sort of thing. That’s actual horror, not the alien invasion or bloodsucking fiends. Just regular uncertainty over your own life. Catherine: What are you currently working on? Kathleen: I’m always tapping away at a couple of different pieces at once. I’ve been toiling away at two different urban fantasy novels, one of which I’ve chipped away at since 2005, the other since 2008. Thankfully, they’re both almost finished at long last, and they’re both very comedic and completely different in tone from ‘We Shadows.’ I’m also creating a composite novel of interlocking short stories set in the same steampunk universe; that work will be a bit darker, a bit more adult, but still not quite as dark as ‘We Shadows.’ The only other horror I have in the pipeline is much shorter; I recently completed a multi-story cycle of horror flash fiction based on the mythology of medieval Brittany. Catherine: What advice would you give to anyone who wants to get their story published? Kathleen: The most important thing I ever did with regard to my fiction writing was join some writing groups. My primary group, one that meets in person once a month locally, has done so much for my confidence and abilities. I could not have done it without those folks, and we do so much for each other in terms of networking, marketing, and even just basic proofreading. It’s phenomenal and has helped all of us do amazing things. We’re able to give each other leads on markets to pursue (and avoid!). We’ve also worked together on common projects, like round robin stories and experimental collections, shared PR ideas, that sort of thing. More than anything, I think a new writer needs a group like this in order to really get their work into shape. You’re always able to be a better critic and editor of someone else’s work, and so even if you’re all starting at the same level when you begin working together, you’ll help each other improve so quickly. Catherine: If you had your own TV chat show and could interview 3 people (living or dead), who would they be and what would you want to talk about? Kathleen: I would love to interview some of the most prolific authors whose work I enjoy and find out exactly how they manage it! Stephen King and Joyce Carol Oates immediately come to mind. Those two have such an amazing work ethic! I’d like to get a peek into their writing routine. I’d also love to find out from Bram Stoker how he feels about the current state of vampire fiction. It’s become almost a genre unto itself and one I have a hard time thinking about writing in because it seems everything fresh has already been done. Maybe it’s time to look back at the master of the form, go back to the origins and whatnot. Catherine: Thank you very much for joining us today. Where can we find out more about you and, crucially, where can we find your book? Kathleen: Thanks for having me! I’m on Twitter at @kwtaylorwriter, Facebook at www.facebook.com/kwtaylorwriter, and I always link new blog entries both places. ‘We Shadows Have Offended’ is available from Amazon, Barnes & Noble, OmniLit, and it’s coming soon to Sony, Kobo, and the iBookstore. The memory often played itself inside Mensonge’s head as he slept, though seldom vivid enough to cause him to wake up screaming. On the plane from New York to Chicago, he fell into a twilight slumber full of an endless loop of the worst thirty minutes of his entire life. Sam just laughed at the two of them, while Roger himself wished he were brave enough to go play with tiny Nona Centini as she sat on the sidewalk nearby, alternately hugging and beating her beloved grey teddy bear. Roger’s tiny cousin whom they’d left back in Haiti was just Nona’s age, and he missed her painfully. “What’s the funny talker think?” Bill was asking. Roger glared at him and longed to answer in his native tongue but didn’t dare. Bill was the only one of the boys who mocked him, and Roger didn’t care for his attitude. “Something is wrong with your head,” he told Bill. There was no longer a sweet toddler on the sidewalk. Nona’s bear was cast onto the grass, and there was still a tiny figure wearing her crisp, white dress. The thing inside the dress, however, was very clearly no longer human. Great interview! I agree that the notion of uncertainty about the person next to you is scarier than the monster you recognize. It also sounds like you have a variety of writing interests- steampunk, urban fantasy, and horror. Congrats on your release. Lovely interview. And wow! What an excerpt! Thank you everyone. And you are right. 'We Shadows Have Offended' is superb.